Use the ecology lesson plan below to introduce your students to factors that alter the environment. 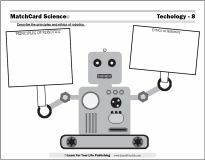 Activities and worksheet are from MatchCard Science. Objective: List environmental factors that alter an ecosystem. Use the activities, discussion questions and MatchCard worksheet to analyze impact of human pollution, fire, green house gases, acid rain, and farm fertilizer on the environment. 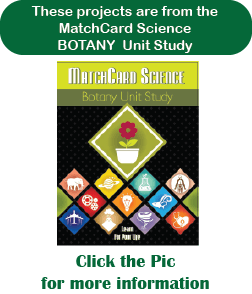 This is MatchCard #2 of the Botany Unit Study. Click on the image to print. The 1st page is the student worksheet. They how each of the five factors contributes to alterations in the environment. The 2nd page is instructor's key. The 3rd page has information pieces for students to cut apart and use on the MatchCard. 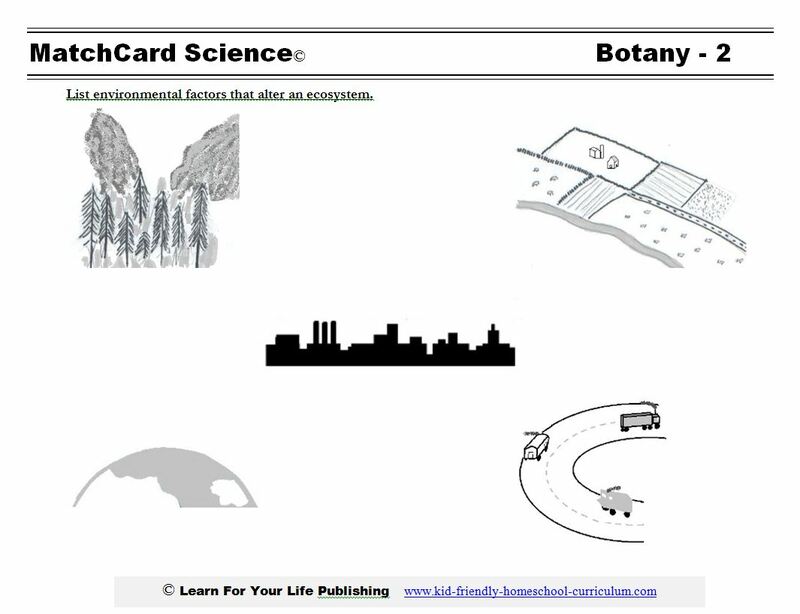 These ecology lesson plans include activities, discussion, the MatchCard worksheet and review, and a project to complete their study. Go outside in your yard or a grassy field. Let your students cut a piece of yarn or string - approximately ten feet long would be fine. They use their string to create a circle on the ground. This is the ecosystem they are going to investigate for a few minutes. The first items come to mind quickly. But give it more time. What else is there? Any other insects that can be seen if you watch for several minutes? What is below the dirt? What microorganisms are in this environment? How do these plants get water? How much water is in the circle now? What animals or insects are several inches below the grass? What is several feet below the surface? Is there anything hundreds of feet below? Does it affect the environment you are looking at? What's in the air above your circle? What animals come to this plot when you are not there? Does the plant life affect the animal? Does the animal affect the plant life? If you did not make a terrarium when studying different types of ecosystems, now is a great time to do so. You will have your own little ecosystem to watch and nourish. What parts of the ecosystem do you have control over? What are you not able to control? What kinds of things would be a risk to your ecosystem? Discuss the last time you had a major grocery shopping trip. What kinds of things did you buy? How many bags did you bring into your house? Before discussing it further, can they quickly list ten items that came from that shopping trip? Better yet, you can save this activity until a time when you lug all the bags into the house. Then have them choose ten items without knowing what will be done next. Think of where those different products came from. What ecosystems did they originate in? Was the environment changed in anyway in the process of getting them to your house? Predict what is going to happen to those products. How long will they be in your house? Where will they go afterwards? Does that have any impact on the environmnet? Make a poster showing where those (or other) items come from and where the final materials go. Events that alter that ecosystem. Well, much of the time it is. Especially if it is your house that catches on fire. No person or animal wants to see their home burnt down. Fires can be manmade or natural. Lightening produces fires at times. While it is often detrimental, sometimes natural fires are beneficial. 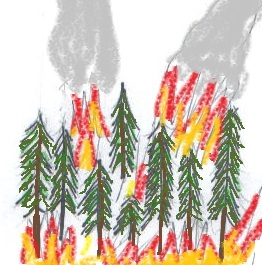 For instance, it can burn trees that might encroach on grasslands and eliminate that particular ecosystem with its unique wildlife. But a downside of fire is that plant and animal communities are quickly destroyed. Fires may get out of control and threaten animal and human life as well as their habitats. Fertilizer is good, isn't it? Of course, we want plants to grow for food for animals and humans. Fertilizer is used to make soil richer in minerals in order to grow more plants. The problem is that it may drain from the soil into streams after a rain. Then the mineral rich environment causes algae to grow on top of the water. Due to the additional algae, sunlight may not reach the plants and fish at the bottom of the stream. Sulfur and nitrogen from factories change the water in the clouds over cities. 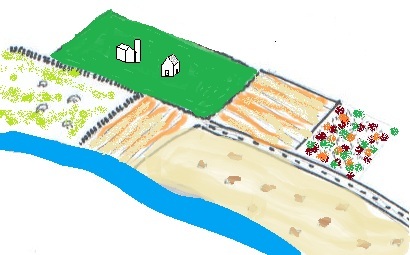 As the acid rain falls, stone and brick buildings are damaged with time. Soil also becomes more acidic making it harder for plants to grow. Carbon dioxide acts like a blanket and traps the sun's heat in the earth's atmosphere. This may increase the temperature of the earth and change the climate in parts of the planet. The greenhouse effect is increased by burning fossil fuels which release carbon dioxide into the air. 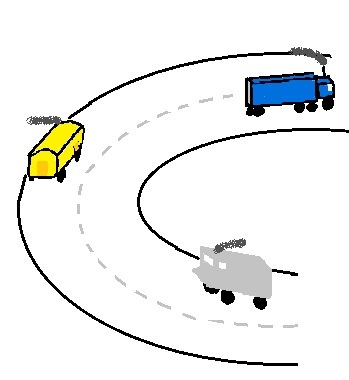 Thankfully, much pollution can be avoided or reversed by making good decisions. Recycling materials reduces land pollution by decreasing the amount of garbage in landfills. Re-using the materials may require less factory output as well. What concentration of fertilizer will affect the growth of algae? For this experiment, you need to obtain four different samples of the same species of algae. You may obtain it from a local pond, aquarium store, or on-line science supplier. Record the growth of the algae over three weeks. Take pictures to document the differences. If you hold the glass up and shine a light through the top, is there a difference in the amount of light that penetrates? If you use a mild acid (like vinegar) to alter the pH of the water, will it affect plant growth? You will need cuttings of plants like a strawberry plant or philodendron that will sprout roots in water. You will also need pH paper to analyze the pH the water the cuttings are in. Have three or four different containers, and add different amounts of vinegar to decrease the pH. Analyze the difference in the amount of new roots grown and the pH of the water. Watch their green thumb sprout when kids use the MatchCard Science Botany Unit Study to learn about the plants all around us. 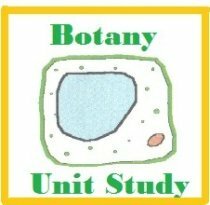 Check out our entire Botany Unit Study with 11 objectives.